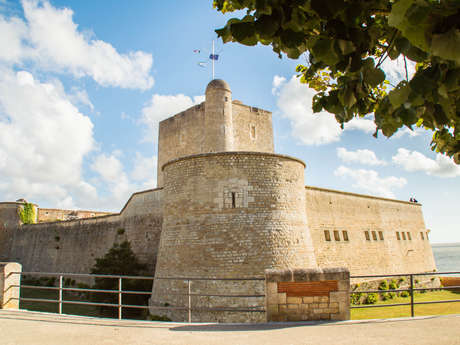 Discover the Fort Vauban, the fortification with many stories. One thing is sure : it has always watched over the Estuary of the Charente. During Medieval time, the fort was the castle of the lords of Rochefort, who used it as a tollgate for boats entering the Charente. In the 15th century, in the place of the castle, destroyed during the War of religion, a dungeon of 30 meters hight is built, to watch the sea from the top of its terrace. It is only during the construction of the Naval Dockyard of Rochefort, that Vauban ordered the fortification and it then became the fort that we know today. For over two centuries, the Fort Vauban defended the shipyard of Rochefort and the Charente river. Overlooking the Grande Plage of Fouras-les-Bains, you cannot miss the gigantic work Fort Vauban. Once inside, you will find the Regional Museum of Fouras, where you will discover fine arts, archeology but also the maritime, military and seaside resort history of Fouras-les-Bains. From the terrace of the fort, do not miss the exceptional view on the estuary and its islands : Aix, Madame, Oléron, Ré but also on the Forts Boyard and Fort Enet. Don't forget to bring your camera to photograph this amazing view that you'll find nowhere else !